First: I agree this TB is not new, no way. 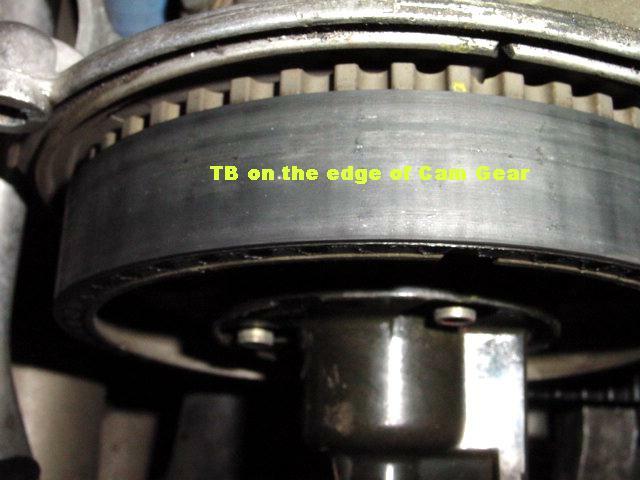 If a TB shows that much wear after 1500 miles, it would have produced some sort of noise and would have failed 5 miles later. Reminds me some years ago I did a project for the British RAF with a big technical team. The last deliverable to a tight time schedule was a user manual. None of the team could write so the content of the manual was awful. Second: I had a lot of fun in my old job at Sheppard AFB. One of my duties was to proof read USAF officer performance reports. 10 YARD PENILE-ITY FOR IMPROPER RENNLIST etiquette! I removed the TB covers on Friday and took some interesting pictures. It is possible that only the WP & TB were changed and nothing else and I mean nothing else! The WP looks new, however if the TB was new it certainly experienced some serious wear in a few miles. At 45 BTDC the timing marks were lined up perfectly. Prior to removing the TB the tension was spot on. 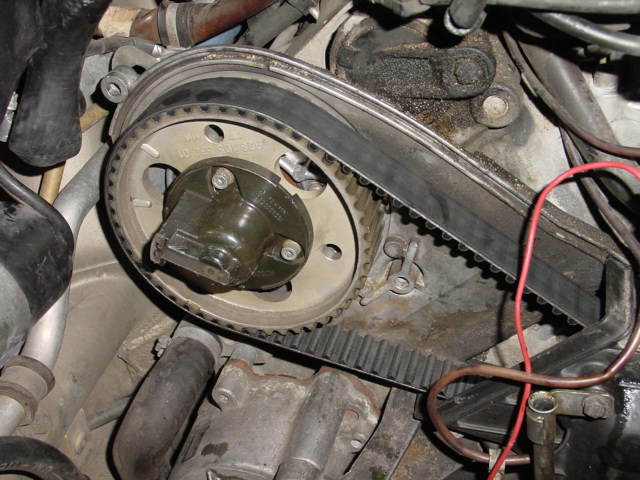 The belt is tracking forward on the right side cam gear and rubbing against the roller arm. 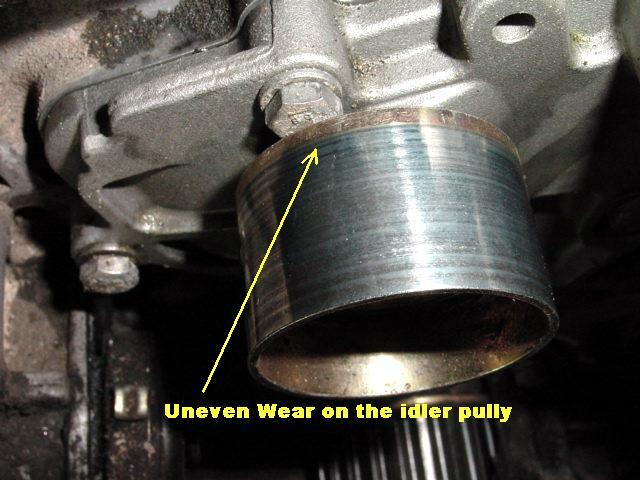 Both the idler and tensioner pulleys show uneven wear. The pivot bolt looks straight to the eye. All the bolts & washers seem to be in the right place. 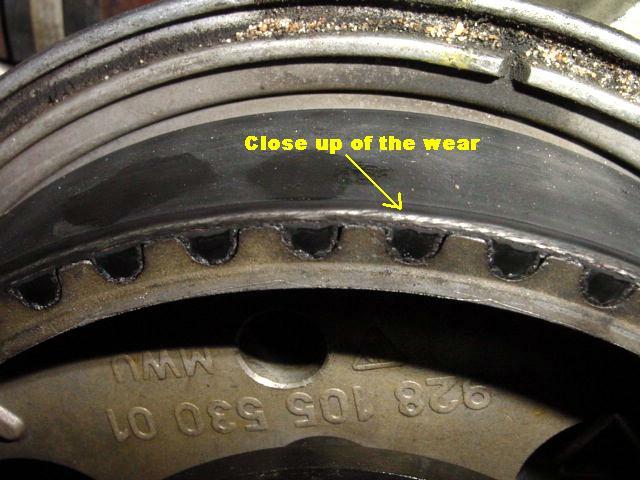 What is causing the belt to track forward or at least be positioned forward and the uneven wear on the rollers? Car is an 86,5 with 60k miles. My bet is a bent tensioner pulley bolt. At least I think that's the bolt - it's the one that BigDave found as the cluprit for his TB failure as well as a few others. 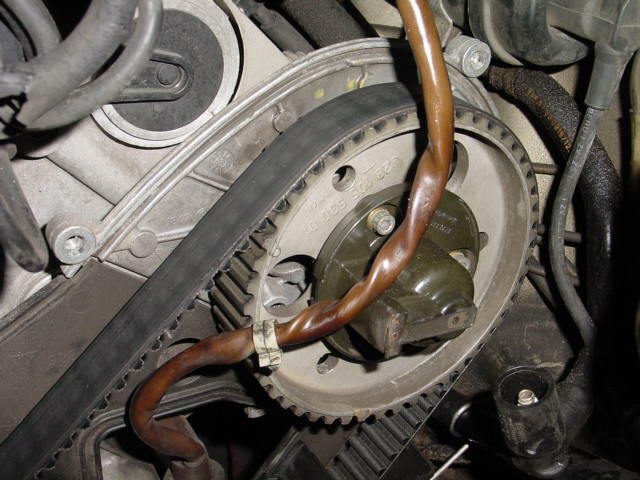 I would first evaluate the carrier arm bushings: does the arm have any play in the radial plane? The bolt looks perfectly straight with a steel rule - how bent are we talking? No play on the tensioner roller in either plane. There is some slight wear in the two non metallic bearing inserts where the pivot bolt passes through. Maybe .015" total. They will be changed. 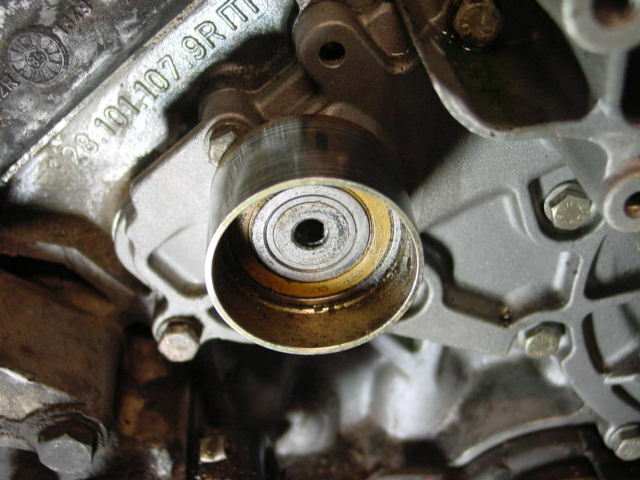 Check the plastic bushings in the Tensioner arm where the shoulder bolt pictured passes thru. 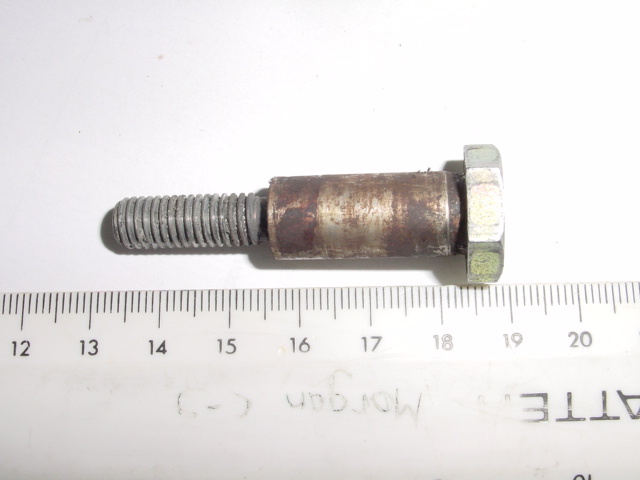 If the shoulder bolt is straight it is probably worn bushings. 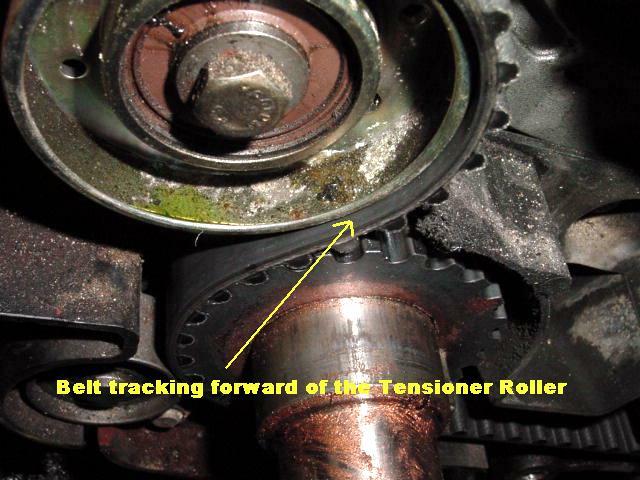 It Could also be that the tensioner arm is bent but i doubt it. Everything is being replaced - just trying to understand what happened in the first place. 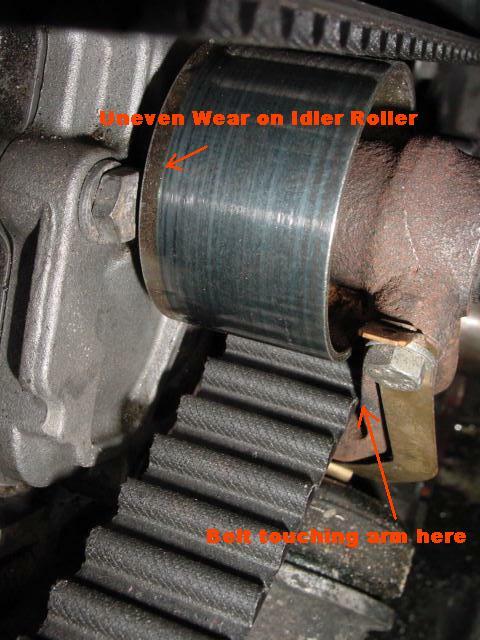 The idler bearing has a small amount of play - maybe .025" total. Definitely on its way out. 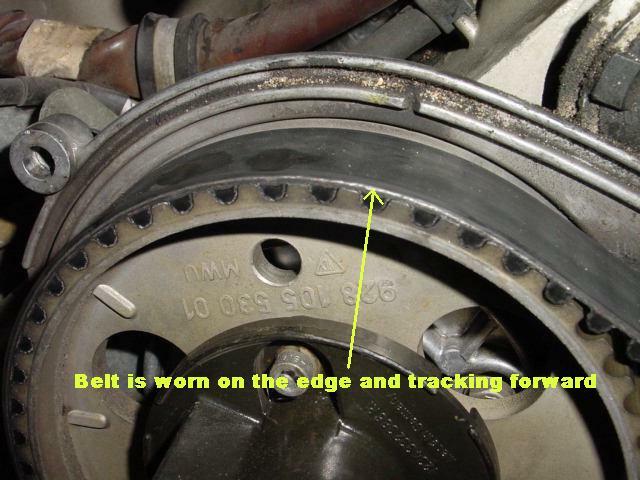 Whats amazing is that IF the WP is new they took the idler pulley of the old one and put it on this one with the wear in the bearing - negligent in the first degree! Rock on, i just did a quick cursory check of the thread.